Methodology and Disclaimer: The objective of this article is to offer a critical analysis of the event in question within the current political and social context in the United States. This analysis will attempt to evaluate the crime scene, as well as the mainstream media coverage of the event itself and major political themes which have been attached to the event by the media and political parties in America. With regards to the crime scene itself, without access to all primary forensic data and CSI reporting, we cannot rightly refute, nor confirm all official statements provided by government and law enforcement officials, but we are able to analyze and take into account three main areas which may challenge certain aspects of the official story; 1) Conflicting eye-witness testimonies; 2) Inconsistencies, errors and factual omissions in claims made by mainstream media and government; 3) Anomalies and patterns in how the media and government are managing this and other similar high-profile shootings and terrorism events; 4) The existence of a mass casualty or shooting drill at the very same location concurrently or prior to the incident itself. Please note that this article contains controversial themes as well as strong opinions, and speculation based on available forensic and media reportage analysis, therefore, reader discretion is strongly advised. We apologize in advance for any readers who might be sensitive to this content, but readers should note that it is not the intention of the author or this publication to offend any said victim or persons involved with or related to this high-profile incident. If readers feel that this article contains any incomplete or inaccurate information, we strongly encourage you to leave any additional information or constructive feedback in the comment section below this article. The Stoneman Douglas school shooting is stated to be the deadliest since the shootings in Sandy Hook and Columbine, but with each passing day after the Parkland tragedy, new details emerged which began to cast doubt over the media-driven narrative for this mass shooting. This, combined with the hyper-politicization of the event by the media and Beltway interests, meant that this event would be distorted beyond what would be considered ‘normal’ for media coverage and commentary for a mass casualty event in America. According to official reports, an expelled 19-year-old former student at Marjory Stoneman Douglas High School named Nikolas Cruz, gunned down 17 people, while injuring another 17 persons, shortly before the school’s dismissal on February 14, 2018. 2:19pm – Nikolas Cruz was said to have arrived via Uber at Marjory Stoneman Douglas High School located in Parkland, Florida. Court documents state that Cruz was armed with an AR-15, a Smith & Wesson M&P15, a gas mask and smoke grenades, while carrying a black duffel bag and backpack with extra ammo during an assault where over 100 rounds were said to have been fired. 2:21pm – According to law enforcement officials, Cruz entered the school’s east stairwell of building 12 carrying a rifle inside a soft black case, whereupon it was stated that smoke grenades set off a fire alarm before sounds of gunfire erupted. While loading a gun prior to the shooting rampage, Cruz reportedly warned high school freshman Chris McKenna in a school corridor, telling him to leave the building reportedly saying, “You better get out of here, things are gonna start getting messy.” Initial media reports stated that McKenna ran across campus to phone his father John McKenna, a special agent with the West Palm Beach DEA, who then called the Broward County Sheriff’s Office to respond to the shooting incident. Mckenna was said to have been escorted to the school’s gate by football coach/security guard Aaron Feis, who was shot after returning to site of the active shooting. However, Feis did not issue a lockdown following Mckenna’s description of events. It is important to note that the initial dispatch to the crime scene by police was based on the eye-witness testimony of Chris McKenna, which ultimately led to the police identifying Cruz, who subsequently confessed to the crime the very next day. 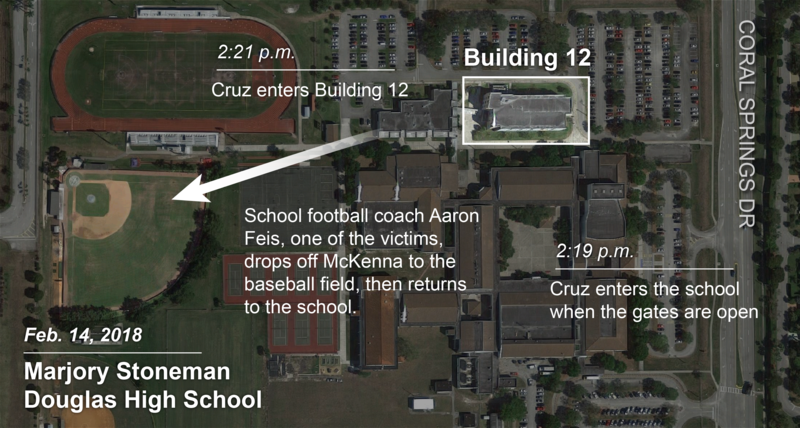 Although initial media reports had McKenna as the only eye-witness to see Cruz at the school – several months after the incident in June of 2018, it was revealed that now disgraced former Stoneman Douglas school monitor and coach Andrew Medina, reportedly witnessed Cruz supposedly heading on a ‘mission’ towards the school, yet failed to act according to training protocols for a school lockdown. Around the same time frame, seven seconds before the gunman’s encounter with Mckenna, another eye-witness, school monitor David Taylor, followed Cruz in a hallway after he was alerted by Medina, but also failed to call in a lockdown procedure. According to police reports, Taylor was later found hiding in a janitor’s closet after Cruz opened fire. 2:22pm – Broward County Sheriff’s deputy Scot Peterson heads to building 12 after running into Medina. Around this time, the first 9-11 call is made. 2:23pm – Peterson and Security Specialist Kelvin Greenleaf arrive at the scene of the shooting at building 12 after being called over reports of firecrackers – less than two minutes after the shooting erupts. It’s important to mention that Peterson initially stated that shots may have been fired outside the building. Peterson radioed “possible shots fired” in building 12. 2:25pm – High school staff eventually enacted a ‘Code Red’ emergency lockdown after failing to do so several minutes earlier. According to police recordings, Broward deputy Michael Kratz reported hearing shots fired by the school’s football field. It’s worth noting that McKenna’s story had more or less disappeared from mainstream media coverage within days of the unexplained attack and some time later media reports revealed that Medina was still kept on staff at Stoneman Douglas even after allegations emerged he had been harassing students, including one eventual victim of the Parkland shooting. 2:27pm – According to the official timeline the shooting lasted 5 minutes and 32 seconds, by the time Cruz dropped his rifle and fled the scene. 3:02pm – Police claim they first become aware that the school’s CCTV cameras were viewed on a delay. 3:41pm – The suspect later made his way to a nearby Walmart and McDonald’s after supposedly ‘blending in with the crowd’ before being arrested by Coconut Creek police. After reviewing police radio transmissions, Peterson believed shots were fired outside, possibly by a sniper and some ten minutes after the shooting ended, reportedly after the alleged shooter Cruz fled Building 12, Peterson thought there was a shooter on the second or third floor. Media reports would later reveal that the AR-15 used in the attack had been legally purchased by Cruz at Sunrise Tactical Supply in January 2018. Coral Springs police later entered the building attempting to neutralize the threat but by that point, the suspected shooter was already gone. Making the chaotic situation even more confusing, Coral Springs Police Chief Tony Pustizzi revealed that the high school CCTV camera footage that depicted the alleged shooter Cruz were on a 20-minute ‘tape delay’. Some “15 minutes after the shooting stopped, according to the sheriff’s timeline,” there was immense confusion on the school campus, as police were not able to obtain access to campus cameras and as radio communication supposedly malfunctioned, they could not locate the principal in order to get a plan of action in place. Furthermore, around that same time, police on the scene questioned why there was a delay on the CCTV footage. Schools Superintendent Robert Runcie has stated that Broward public schools have cameras which show images in real-time but can also be viewed on a ‘tape delay’, but was unaware the police were confused if the tape was live or not. Criminal justice professor Pete Blair, also an executive director of the active shooter response program at Texas State University, had never heard of a time delay on any school system cameras. STOCK & TRADE: The image of members of public, in this case Parkland students – all considered as ‘suspects’ by police, being marched off site at gunpoint has become a standard media image which is always promoted in by mainstream outlets. Coincidentally, the suspect is believed to have safely exited campus in this very fashion. However, if the surveillance video inside the Parkland school was rewound as authorities have more recently claimed, this latest official detail appears to have put the initial arrival of deputy Scot Peterson and Security Specialist Kelvin Greenleaf in question. In other words, if we are to accept the testimony of Peterson that both he and Greenleaf were at building 12 shortly after gunfire broke out, they arrived as the shooting was in progress. Whether or not the interior video footage was rewound or delayed during a review, the live video feed should have shown a suspect in the building, as there would have been an active shooting scenario underway in real-time. QUESTION: What would be the need to rewind CCTV video footage – when a gunman is still on the loose, wouldn’t the live feed be more critical in locating the whereabouts of the suspect? As it turns out, this would be one of many acts of negligence and dereliction of duty on the part of law enforcement officers, the FBI and school staff. NOTE: In 2017, Stoneman Douglas High School participated in active shooter training protocols with the Broward County Sheriff’s Office in the months leading up to the Parkland tragedy in 2018. KEY QUESTIONS: Statistically speaking, what are the odds that the exact scenario Stoneman Douglas High School had been training for would come to pass so soon? Moreover, is there any link, casual or otherwise, between these militarized live ‘active shooter’ drills and the said event on February 14, 2018? Lastly, and perhaps mot importantly: what are the psychological effects on all the student who are subject to real simulated violence on a regular basis? We accept that these may be uncomfortable questions to some, and these are certainly questions which mainstream media operatives and broadcast journalists are not willing to ask for fear of being branded “insensitive” following a tragedy, but we believe that these are exactly the kind of questions that could help provide a deeper sense of understanding of really happened at this event and why, while potentially providing some insight into the dynamics of a chaotic situation as well as some answers, and perhaps even contribute towards some closure for victims’ families and friends. Incidentally, two days after the mass shooting at Stoneman Douglas, Broward County officials were already calling to tear down the three-story school building where the shooting event took place. If you recall, in November of 2013, one year after the Newtown shooting, Sandy Hook Elementary School was demolished, forever burying any chance of revisiting that crime scene for an on-site forensic investigation. This added yet another unusual and dramatic twist to what can only be described as another bizarre, seemingly motiveless known wolf mass shooting attack similar in scope to Parkland. Aside from a host of questions surrounding the shooting itself, many non-mainstream media researchers and journalists have wondered how a relatively untrained civilian and alleged lone gunman was able to carry out a shooting attack at Stoneman Douglas High School. What amounted to small arsenal on hand, the alleged shooter Cruz, was able to quickly suit-up in his mask and body armor, while moving from ‘room to room’ on multiple floors, where he supposedly took up a tactical position in order to set-up what authorities called a sniper’s nest. According to media reports, he later returned to a classroom where he had previously fired upon, before finally removing all body armor following a struggle to reload an AR-15. Authorities believe this is when Cruz ditched all his fire arms and equipment, while completely eluding police as he casually walked off campus supposedly by blending in with his former fellow students, easily exiting the Parkland school already in lockdown mode – in just six minutes. Such a complex series of actions seems highly unlikely, and yet this is the official story – and for whatever reason, it has gone unchallenged by nearly every member of the mainstream press. QUESTION: How is it that a reportedly mentally unstable teen with disciplinary problems was able to physically, mentally and logistically carry out what amounts to an extremely well-coordinated assault – even by military standards – and then casually flee the crime scene of the incident in only a matter of minutes? Interestingly, Lippel’s description of Cruz differed quite a bit from the CCTV footage shown inside Stoneman-Douglas, while some pictures display the alleged shooter facing away from the camera with a dark flak jacket, he was hardly wearing full paramilitary gear during the shooting attack. Here’s a look at the alleged shooter as he entered the school’s east stairway – what do you see? Shortly after the Florida school shooting, a fake news story was planted in the mainstream media which falsely claimed that Cruz was associated with an extremist white nationalist group. This fake news story was amplified and disseminated by a number of dubious organizations, along with the Anti-Defamation League (ADL). It would later be revealed that the ADL had cited as one of its ‘sources’, 4chan, a popular hacker hangout site, and suspected ‘limited hangout’ for laundering disinformation by federal informants, mainstream media operatives, and agent provocateurs working on behalf of the state. In the aftermath of many other similar high-profile events, 4chan has often been linked to sensational postings presented by mainstream media as real leads, but which later have turned out to be red herrings. The purpose of this type of red herring is clear – to immediately associate this school shooting event with a highly unpopular and evocative fringe political movement in the US – providing an immediate lightning rod for corporate mainstream media outlets like CNN to do what they do best which is to speculate and invent storylines – some of which might only last for a few hours, but during that few hours these fake narratives will be able to penetrate the national consciousness and exacerbate an already highly charged and politically polarized atmosphere. Unfortunately for Sheriff Israel and his Broward department, in the week following the Parkland shooting, it was revealed that Broward County Sheriff’s Deputy Scot Peterson, along with other deputies, stood down and never entered the Stoneman Douglas school building while an active shooter scenario was underway. Peterson was abruptly suspended without pay, prompting the long-time officer to resign after a media press conference where Broward County Sheriff Scott Israel, glibly outlined Broward’s police response to the attack. In addition, the public learned that two other deputies, Edward Eason and Guntis Treijs, were put on a restricted assignment following a review of their involvement in police calls involving Cruz and his brother. The polarizing political minefield surrounding the Broward Sheriff’s Office came, as a news release disclosed that there were eight deputies on the scene that did not enter the high school while the apparent shooting took place. “When Coral Springs police officers arrived at Marjory Stoneman Douglas High School in Parkland, Florida, on February 14 in the midst of the school shooting crisis, many officers were surprised to find not only that Broward County Sheriff’s Deputy Scot Peterson, the armed school resource officer, had not entered the building, but that three other Broward County Sheriff’s deputies were also outside the school and had not entered, Coral Springs sources tell CNN. The deputies had their pistols drawn and were behind their vehicles, the sources said, and not one of them had gone into the school. As far as the mainstream narrative goes however, the apparent ‘inaction’ of Peterson and the several other Broward deputies prompted the moniker of “Broward’s Cowards” – the name given by frustrated residents and students who were angry at the Sheriff department’s inability to provide the bare minimum of protection to the public. IMAGE: Scott Peterson, Broward County Deputy and School Resource Officer assigned to Stoneman Douglas who, according to Sheriff’s Dept, was on campus, armed, took up a position during the event but did not engage the shooter. From a legal standpoint, Peterson and his former colleagues may have been thrown an inadvertent lifeline, courtesy of Sheriff Israel, when later it was revealed that Israel’s office had issued a de facto stand-down order to his deputies, or a ‘wait-and-see’ approach where the deputies were told to remain off-campus and not to engage the shooter until further notice. QUESTION: Why did the media steer the public towards Peterson and other deputies when clearly there was culpability from top officials in Broward County? In many ways, media focus still seems centralized around the officers who were ordered to stand down. Shortly after the Stoneman Douglas shooting, Sheriff Israel positioned himself as a gatekeeper in this investigation. In the month following the shooting, Sheriff Israel refused to release all surveillance video that might have shed more light on key aspects of the mass shooting event. However, following a bizarre media lawsuit to get the CCTV video released, some surveillance footage was released which depicted Stoneman Douglas school resource officer Peterson and a civilian security guard roaming outside the campus grounds and then pausing to call police dispatch while the suspicious rampage was underway. It wasn’t until many months later, some of the school’s interior footage was released supposedly depicting the alleged shooter Cruz. As questions emerged regarding the lack of engagement concerning Broward deputies during this ‘active shooter’ attack, Peterson’s lawyer, Joseph DiRuzzo III of Fort Lauderdale, released a statement where his client revealed that he “thought that the shots were coming from outside,” which was the reason he “took up a tactical position,” outside of the school. QUESTION: Were these statements issued by Peterson’s attorney just damage control in the face of his client’s alleged negligence or was there something worth considering regarding the police veteran’s testimony? “Allegations that Mr. Peterson was a coward and that his performance, under the circumstances, failed to meet the standards of police officers are patently untrue,” said DiRuzzo. Even after reinforcements arrived, the Broward deputies still refused to engage the active shooter on campus. While Tapper appears to take a hard stance on Sheriff Israel regarding the lack of police response to the Stoneman Douglas school shooting, the above segment reinforced certain questionable aspects of the official narrative, and could be seen as more of a nuanced form of media propaganda providing a smoke screen for the flawed actions of law enforcement. However, CNN’s Tapper, quickly fell back into the media’s preferred direction of inquiry which is a multi-million dollar, Democratic Party-driven national political campaign for gun control (see more on gun control below). “The video clip begins shortly after gunfire erupted, with Peterson and civilian security monitor Kelvin Greenleaf walking with purpose outside an administration building, clearly alarmed by sounds. When the fire alarm is triggered — apparently by the smoke of the gunfire — the two begin running, get into a golf cart and speed toward Building 12. In short order, the mainstream media and former law enforcement pundits weighed-in on this new development, focusing on the apparent inaction of the Parkland school resource officer, and not other strange anomalies observed in the CCTV footage, as the panicked security team looked to be in distress after what appeared to be the start of the shooting attack, a small group of people can be seen calmly walking around campus. If this was a ploy by Sheriff Israel to conceal the rest of the event, then it worked. It wasn’t until much later in 2018, that Broward County released a short video from the interior of the school – something that only fueled more speculation as to what really happened in Building 12. As the Broward deputies were found to have also been ordered to ‘stage‘ outside of the building in order to secure the perimeter prior to entering the school. The apparent directive caused a wave of controversy, because even though police are not required to have permission to enter a building in an active shooter scenario according policy protocols, the commanding officer may have information that other subordinates do not. With that in mind, is it not likely that the delay in response had more to do with leadership than those on the ground? In addition to all this, Police radio recordings appeared to reveal even more failures by Broward County police in their handling of Parkland attack. In March of 2018, Jordan resigned from the BSO. Following the release of 911 calls regarding the Stoneman Douglas mass shooting, an ex-FBI and CIA agent turned CNN counter terrorism analyst, Phillip Mudd, also laid blame with officers first on the scene. However, an astute observer of these events should treat any media and law enforcement redirection of blame with a grain of salt, as it only served to mask the peculiar role played by the FBI and other law enforcement officials leading up to this shooting crisis. QUESTION: With all of the federal funding now allocated to Sheriff’s departments, as well as state and local law enforcement across the US, and with all of the ‘active shooter drills’ being staged every few months, is it worth the extreme public expense if police and first responders cannot actually react to any ‘live’ situation? QUESTION: Was this inconvenient piece of information being used to divert attention away from the apparent drill activity believed to have taken place earlier on the very same day? As the official narrative in the Parkland began to unravel, the media and authorities began to quickly change tact, and proceeded to blame high-ranking personnel for a series of ‘bad commands’, while obscuring other forensic details and prior knowledge negligence in the case that point to potential malfeasance. The perfect foil for this entire event came in the form of Sheriff Scott Israel, whose own self-styled cult of personality, along with his bizarre and brash behavior in media interviews, invited an eventual firestorm of criticism. Calls for Israel’s resignation, coupled with the confusion over local law enforcement’s performance at the crime scene, no doubt provided convenient cover for another culpable entity in this case – the FBI. In January of 2019, Israel was removed by Florida governor Ron DeSantis 10 months after the Parkland shooting. “I just want to, you know, get it off my chest in case something does happen and I do believe something’s going to happen,” claimed the FBI tipster, according to the transcript. The FBI tipster also expressed concern over several social media accounts allegedly linked to Cruz on Instagram, while stating that the apparent gunman had the mental capacity of a 12-14 year-old and been kicked out of school for his violent behavior towards students as well as staff. In any case, all of these developments placed local law enforcement officials in a precarious situation as they – just like the FBI, were well aware of previous threats made by Cruz prior to the Valentine’s Day shooting. This information further compounded the FBI’s apparent ‘mishandling’ of a violent threats associated with Cruz leading up to the Parkland event. Similar reports of Cruz’s unstable behavior were also overlooked by the regional CPS. As with Broward County Sheriffs and FBI, the Florida Department of Children and Families had also been alerted to Cruz’s threatening behavior. Snapchat posts of Cruz cutting his arms and discussing his guns were labeled as “low risk” by authorities. Over the years, Nikolas Cruz received specialized psychiatric and other clinical treatment, while also taking prescription drugs for his apparent mental state and yet, in the wake of the highly suspicious Parkland shooting the dominant discussion in media is about gun reform, while avoiding any serious inquiry into the connection between many violent active shooters and side effect-laden psychiatric drugs they’ve taken. By all accounts, Nikolas Cruz should have been the most well-known wolves in his area. However, the mainstream media, led by CNN, have purposely avoided this gaping hole in what has now become a completely politicized narrative centering around the issue of gun control. Although the alleged Stoneman Douglas shooter Cruz purchased his firearms legally and is said to have been expecting a large family inheritance in addition to money from an insurance claim (these claims are only media reports – and have yet to be substantiated with official documentation), it seems that his ‘probate matters’ are still unresolved even after the shooting, further adding confusion as to how the young teen was able to furnish the funds needed for weaponry used in the attack. From 2008 until 2017, there were at least 45 police reports associated with the misbehavior of Cruz and his younger brother, far more than the 23 already acknowledged by Broward County Police. It was previously mentioned that there were 39 police calls over the course of a six-year period. These reports included emergency calls over domestic disturbance issues and child abuse, further confirming that the unstable Parkland shooter’s history was already well-known to authorities and the Florida Department of Children and Families. In this sense, the shooter Nicholas Cruz was a known wolf. Reports state that the apparently mentally ill shooter Cruz tried to take-up a military-style tactical position in order ‘to target unsuspecting victims’ during the high school shooting. It was later revealed that Cruz was a member of the Army Junior Reserve Officer Training Corps program at the high school the previous year, but due to disciplinary issues had been expelled from Stoneman Douglas High School. Scot Peterson’s statement initial statement about hearing shots outside of the building, raised a number of questions that suggested the possibility of a potential second shooter or multiple shooters on the Parkland campus. In the immediate aftermath of the incident, multiple eye-witnesses claim to have seen or heard evidence of multiple shooters at Stoneman Douglas on February 14th, 2018. According KHOU’s Matt Musil, the second blonde female student in the video above, is a “former student” Alexa Miednik who testified on camera that there were multiple shooters and that she casually walked with an unarmed Cruz out of the school after the said incident. It is not known why Alexa was on campus or if she was indeed a former student as local report Musil stated here. According to the Mirror, Miednik was walking and talking with Cruz as students left the building when the fire alarm went off. Why this is important is because many of the mainstream media’s hand-picked student activists (including David Hogg), have claimed that is was Nikolas Cruz who pulled the fire alarm in order to ‘draw out’ students where they could be ‘picked-off one by one’ by the shooter from his tactical sniper nest position. If Miednik’s testimony is to be admitted into the record, then Hogg and others’ claims that Cruz pulled the fire alarm and then picked off students – would be an impossibility because Cruz cannot be in two places at the same time. QUESTION: Was Miednik’s testimony authentic or just another red herring in the Parkland saga? According to School Resource Officer (SRO) Scot Peterson’s earlier statements, the SRO took up a ‘tactical position’ between two nearby buildings before initiating a ‘Code Red’ lockdown of the campus. It was then reported via Radio communications indicated that there was a “gunshot victim” in the area of the football field, which may explain Peterson’s belief the shooting was outdoors. Of course, this would be a problem for the official story because it would indicate the presence of multiple shooters. If indeed this part of the story was being covered up, then the next question might be: is is possible that another actor is playing the ‘man in the middle‘ during the Parkland event? QUESTION: How is it possible that multiple eye witnesses claimed that there may have been multiple shooters at Stoneman Douglas High School? Was this just a coincidence, did authorities follow-up on these reports? While the Florida school shooting is difficult to parse for mainstream audiences, those aware of the correlation between active shooter training scenarios and eventual real-life crime scenes have documented a series of patterns and developments that have shown time and time again how so many of these high-profile attacks happened at the very same locations where active shooter training sessions had taken place prior to, or at the same exact time as the apparent ‘active shooter’ incident. Interestingly, two days after the sensational attack at Stoneman Douglas High School, Attorney General Jeff Sessions ordered an “immediate review” after it was revealed that the FBI had prior knowledge of Cruz and the “potential of him conducting a school shooting,” as his behavior and social media posts were cited in multiple tips to law enforcement. NOTE: Hänsel also noted the significance of political party pressure used to hastily ram-through new gun laws and regulations in the wake of this latest tragedy – which was exactly what happened in the aftermath of Parkland. Some of America’s most high-profile attacks in recent years have placed a heavy spotlight on the FBI’s often shaky relationship with alleged attackers prior to their suspected involvement in mass casualty incidents. In addition to the Garland Shooting, other similar cases are well-documented like the Orlando Pulse nightclub shooting in 2016, where the prime suspect Omar Mateen was interviewed by the FBI several times before the country’s largest mass shooting. In addition, his father Seddique Mateen was named as a confirmed FBI informant from 2005-2016, as well as a suspected CIA asset too. 21WIRE noted the significance that the elder Mateen, who was looking to run for President of Afghanistan prior to the bizarre Orlando shooting – an unlikely story perhaps, but completely fitting for a Washington DC deep state operative and Taliban-allied CIA asset. In March of 2018, Salman was found not guilty on all charges of aiding and abetting her husband in the Pulse nightclub shooting rampage. This news came just days after Seddique Mateen’s informant status with the FBI and international connections to terror were revealed through court proceedings. While mainstream pundits are quick to label these revelations as “conspiracy theories,” they cannot argue with the facts of Orlando and other cases – which draw a clear link between the alleged perpetrators and federal law enforcement and intelligence agencies. Additionally, the Fort Lauderdale–Hollywood International Airport shooting incident involving Esteban Santiago-Ruiz, revealed that the shooter met with FBI officials on at least one occasion prior to the attack. “A Newtown resident told the FBI that Nancy Lanza said Adam had once hacked into a government computer system and federal authorities — either FBI or CIA agents — showed up at their door. Based on this new evidence, it seems highly likely that the suspected Sandy Hook shooter would have been monitored closely by various law enforcement and intelligence agencies after committing an apparent illegal computer hack that may have been a matter of national security. In other words, Adam Lanza was another known wolf. Historically speaking, government operators have often made use of low-life criminals, and mentally disturbed individuals to fulfill various roles in entrapment stings or sometimes as bona fide actors in an actual attacks. In fact, very often those being ‘watched’ by authorities exhibit all the qualities of either a ‘patsy’ or low-level informant, working either directly for a law enforcement or intelligence agency, or under the supervision of a federal handler or informant, as in the cases of Elton Simpson (Garland Shooting) and Christopher Lee Cornell (Cincinnati ‘terror’ bust). These are only a few examples. The precarious relationship between criminals and security agencies, is where a ‘lone wolf’ is able to rise through the ranks of a law enforcement or intelligence operation, eventually evolving into a known wolf suspect. This allegedly “right-wing bomb plot” was reminiscent of the highly controversial bombing of the Alfred Murrah Building in Oklahoma City in 1995. The FBI’s role in cultivating radical right-wing militias in Elohim City where Timothy McVeigh was active, was detailed in the documentary film, “A Noble Lie“. To date, no government or mainstream outlet has ever refuted any of the evidence presented in that report. Similarly, the apparent Parkland mass shooter, Nikolas Cruz, was in close contact with a military analyst prior to his known wolf status with the FBI. In November of 2017, following the death of Lynda Cruz, Nikolas moved in with the Snead family who became his de facto foster parents, prior to the typical 4-6 months for a foster assessment and approval to take place. Bizarrely, it was then revealed that James Snead, was a “decorated Army veteran and military intelligence analyst,” yet neither he nor his wife had any indicators leading to Cruz’s apparent violent rampage. The Snead’s also allowed Cruz, a sufferer of depression,“… attention deficit hyperactivity disorder and autism” – to bring his gun collection to their home. According the family, they did not mind Cruz’s firearms, so long as “he [Cruz] followed the rules,” said Snead. ‘The rules’ entailed that Cruz keep his guns in a standard gun safe. “I thought I had the only key to the gun safe,” said Snead. It is still unclear how Snead knew Cruz had his own key to the gun safe. This claim is central to the case and would have to be proven one way or another – and the implications are huge if Cruz did not have his own key to the gun safe, as this would imply he either stole Snead’s key, or Snead potentially helped Cruz gain access to his firearms prior to the shooting spree. So Snead ‘figured out’ Cruz must have kept a key for himself? Considering the weight of this story, is it responsible to settle a central key to this murder case on a hunch? This is potentially one of the most important details in this story because it would either prove, or disprove, the means with which the suspect could carry out the murder. Incredibly, this detail has been systematically ignored by every major media outlet in the US. Over the course of the American ‘known wolf’ gunman saga there’s been numerous shooting cases with links to military intelligence and in some cases high-ranking officials, and rather than question these uncanny associations, the media perpetually forces the public to repeatedly relive the trauma of a tragedy without any resolution. Later on, these same media outlets will never again revisit any of these strange and unexplained connections between a known wolf and the military or security agencies. As far as mainstream journalists are concerned, any such connections are trivial and coincidental. It was then revealed that Nikolas and his brother Zachary, were entitled to receive an annuity from an insurance claim after the death of his adoptive father Roger Cruz when the pair became adults. According to court documents, the boys’ adoptive mother Lynda Cruz, was said to have reached a $175,000 dollar settlement in 2008 over a medical malpractice suit related to the death of her husband. On November 28th, 2017, police received a call from, Roxanne Deschamps, regarding the alleged violent behaviour of Nikolas Cruz, after she took the teen’s guns away from him. Deschamps was a close family friend and apparent caretaker for Nikolas and Zachary after their mother passed away. Zachary was being looked after by Deschamps at the time of the Parkland shooting. In December of 2017, Broward County Probate Division Judge Charles Greene, oversaw a case where Cruz attempted to gain early access to an $800,000 dollar inheritance he was set to receive at 22 years of age after the death of his mother Lynda Cruz. Interestingly, Cruz reportedly signed an agreement to retain lawyer Audra Simovitch and just one day after the Florida shooting, Simovitch filed a claim on behalf of Deschamps. “A Boca Raton attorney handling the case, Audra Simovitch, now is claiming in court documents that Deschamps is blocking discovery of the true assets in the estate. QUESTION: Did authorities fully examine those who may have had access to bank accounts associated with the Cruz estate? It seems this would be an extremely significant detail, one that could possibly provide a deeper understanding of how Nikolas Cruz was able to obtain the funding needed for weaponry prior to the Parkland attack. If these probate matters were still pending, it poses serious questions about how Cruz obtained access to any large cash sum. Interestingly, the attorney representing Cruz in his criminal case, Melissa McNeil, the Assistant Public Defender in the Homicide Division of Broward County’s Public Defenders, revealed some $3,333 dollars of an inheritable annuity “potentially worth hundreds of thousands of dollars,” was deposited into a bank account that the alleged shooter had access to shortly before the death of Lynda Cruz in November of 2017. QUESTION: Did anyone else besides Cruz have access to the bank account where the annuity was deposited in November of 2017? This information came over two months after the high-profile Parkland shooting and still leaves a financial puzzle worthy of a forensic accountant. Although this does for the first time explain some access to funding prior to the Parkland tragedy, it still fails to reveal a full picture as to how the young teen furnished the funds for at least ten high-grade firearms, not to mention body armor and other tactical gear. In yet another uncanny development as the battle for the Cruz estate continues, Nikolas Cruz via his attorney, has supposedly agreed to donate all future benefits from his inheritance to the charity of choice for victims’ families. Casual observers might latch on to the emotional component of this element of the story and see this as at least in part a form of financial justice in the Parkland tragedy. However, given the information we’ve documented above, the newly formed decision also calls into question the role and facilitation of benefits from the Cruz estate and the blocking of their ‘discovery’ by Deschamps. In a bizarre scene just weeks after the Parkland event, Zachary Cruz, the younger half-brother of shooter Nikolas, was arrested on March 19th after entering Stoneman Douglas school grounds. Normally, the bond for misdemeanor trespassing is typically $25, yet for some unknown reason, the judge set 18-year-old Zachary Cruz’s bond at $500,000. The younger Cruz’s public defender Joseph Kimok was lobbying for a different judge and charges dismissed, the judge proceeded to order the $500,000 bond, ordering Cruz to wear an ankle monitor. As part of his bail, a restraining order was imposed where he is to have ‘no contact with Marjory Stoneman Douglas students or staff’ and cannot travel within one mile away from the school and to have no contact his brother who is in custody. Even more incredibly, Zachary Cruz was then used by police as the BETA test for the brand new emergency gun laws which were rushed through Florida’s state legislature in the emotional aftermath of the Parkland school shooting. This is by definition pre-crime – as Zachary Cruz had not committed any crime, but was forcibly detained and processed through the state’s mental health system. According to court documents from the Palm Beach County Sheriff’s Office, police also questioned Zachary Cruz on February 16th. QUESTION: Why were law enforcement so adamant about isolating Zachary Cruz from anyone connected to this case? Previously, 21WIRE has analyzed the nature of many peculiar shootings and mass casualty incidents across parts of America and Europe. These are truly post-modern crimes which have also given birth to a new kind of ritualized mass-trauma played out on mainstream media, where a host of sociopolitical agitprop TV programming covering a bevy of themes including gun reform, religion, race and ‘security’ – all rolled out across all media platforms and normally with a conformity of messaging. Often these emotionally-driven media reports fail to look at the glaring forensic anomalies of the crimes that the public has been be so affected by. In the surreal aftermath of the Orlando pulse nightclub shooting, we outlined the disturbing links that the shooting had with a heavily stylized production company CrisisCast, whose organization appeared to be a revamped version of the Visionbox Crisis Actors project (a crisis actor production emerging after Sandy Hook), complete with a professional team of actors, elaborate film crews, expert producers and theatrical effects makeup squads mimicking real-life injuries (additional prosthetics) – all focused to deliver a simulated crisis-like reality to the public. Following the 2016 Orlando shooting attack, it was revealed that the world’s largest security firm G4S,had employed Omar Mateen, the man named in the Orlando pulse nightclub shooting. As it turned out G4S was also client of the mass casualty and crisis actor agency and production staging company called CrisisCast. It’s important to note how macabre specialist ‘safety’ firms like Crisis Cast were managed accordingly through their public relations division via various forms of social media as part of a new burgeoning ‘active shooter’ industry not just in America, but in Great Britain and Europe too. Not surprisingly, revelations of these new ‘crisis’ firms and their relation to certain high-profile mass casualty events, including the apparent on-site rehearsal prior to UK’s Manchester Bombing in 2017 – at the exact same location as the bombing itself – all of which as fueled a lot of skepticism by independent researchers, YouTube producers and independent journalists. Hence, some of the students from Marjory Stoneman Douglas High School have also been called into question by a tidal wave of internet sleuths and citizen journalists. As a result, independent investigators and bloggers alike, have been maligned as a coordinated right-wing conspiracy, causing media backlash over what has been dubbed a “crisis actor conspiracy” by mainstream outlets. The inflammatory media reaction appears to be an attempt to drive a wedge between those who are critical of how the mainstream media has covered this mass shooting (one that has very real political implications) and those who are defending the dominant political narrative being advanced by Democratic Party-aligned broadcasters CNN, MSNBC, as well as corporate giants NBC International, CBS, ABC and others. Even though a number of significant questions remain in the wake of this school shooting, the public have been forcibly redirected away from the forensic and crime scene sphere of this case – and thrust into one of the most emotive political campaigns in living memory. This is evident by the mainstream media’s focus on gun-reform. Within this media prism, we are seeing one of an exploitative media spotlight placed on a carefully selected group of high school students, under the auspices of the Democratic Party establishment in the US. This opens to door to an all too familiar and often tawdry tradition in American politics known as Astroturfing, whereby a political faction of the ruling Establishment attempts to create an impression of an organic or ‘grassroots’ upswell of support for a new policy or political movement. In recent years, the mainstream media, along with members of the establishment, have managed to leverage these mass shooting events for maximum political benefit. While it normally takes days, or weeks for the media and political actors to generate momentum for their campaigns, in the case of Parkland, this process began within 24 hours of the event itself. This was achieved by taking news consumers out of forensic realm and into the political arena as quickly as possible. Once this process was initiated, all of the mainstream media outs in the US adopted an identical approach to coverage – focusing only on the hand-picked cadre of student spokespersons – who appear to have been fed more or less identical talking points from their first appearances on mainstream media (see more on the political scripting below). What’s most telling about Parkland is how all of the focus has been placed on the ‘survivors’, while the victims have been effectively muted from the media spotlight. This is a sharp contrast from Sandy Hook massacre where the overwhelming focus of coverage and post-shooting political activism was based primarily on the victims and the victims’ parents. The explanation for this is would be that this was a deliberate decision by those who are in charge of deciding who and what get elevated to prominence; these persons would be the media producers and their political cohorts. In fact, many viewers were already suspicious as Hogg moved from media outlet to media outlet in the day following the shooting – delivering more or less the exact same talking points as other hand-picked student colleagues. The repetitive scripting was eery to say the least. It would later surface that all of these media-friendly, photogenic student models were in fact enrolled in the school’s acting program – so any notion that these students just randomly made their way in front of CNN’s camera’s quickly became tenable. This would indicate a degree of coordination between either school facilitators and the media, or Democratic Party activists and the school coordinators – or both. To say that these hand-picked students and their lightning-fast political talking points and campaign was planned in advance would be speculative, but we can say with 100% certainty that the whole production was a massive Astroturfing initiative steered by a national political entity, the media and faculty and students – as soon as the mainstream media were on site. Adding to the scripted-like nature of the media’s treatment of the Parkland tragedy, more questions emerged when Colton Haab, a JROTC student at Stoneman Douglas, stated that, Carrie Stevenson, a CNN executive producer of special projects, attempted to stage-manage Haab’s address during CNN’s ‘Town Hall Meeting’ on the subject of gun legislation. Because Haab’s political position on the gun issue was to the right of CNN’s scripted talking points, the network appeared to want to change Haab’s lines to be suit a left-wing agenda. As a result of the media manipulation, Habb declined to attend the event, opting to take to other forms of media to respond to CNN’s efforts to stage-manage his media opportunity. "To the President… if you are against us, then that means you are signing our death certificates." Tarr performed another politically scripted diatribe here with Democrat Party-aligned network MSNBC. These are just a few of dozens of similar clips which demonstrate how well-coordinated all the political messaging was – made possible in large part by Democratic political activists and producers from CNN, MSNBC and others, working diligently behind the scene immediately after the tragedy unfolded. NOTE: What’s perhaps most disturbing about this type media segments is how willing and able mainstream corporate media are to use children for the purposes of advancing a particular political agenda, or upcoming election. In this sense, the children merely serve as ‘short-term celebrity’ commodities for the media news cycle, as well as for a national network of quangos and partisan interests. Additional concerned were raised after student David Hogg revealed in a televised interview on CNN that his father Kevin Hogg is in fact a retired FBI agent. As expected, this revelation set social media a blaze with comments and speculation as to young David’s authenticity as the ‘accidental spokesman’ for this new national movement which seemingly sprung up within 72 hours of the event. This prompted Kevin to accompany son David on Anderson Cooper’s show for what can only be described as a bizarre damage control interview designed by CNN in order try to beat-back a wave of criticism over David’s numerous contrived media performances, and accusations that Kevin Hogg was somehow in league with the government. Hogg and other students appeared to be drilled on a series of identical arguments which sought to compare the Parkland shooting to two other high-profile foreign events, Scotland’s Dunblane school massacre (1996) and Australia’s Port Arthur shooting spree (1996), two large-scale international incidents that led to controversial changes in gun legislation, culminating in the banning of certain firearms under parliamentary law. Hogg and others’ invocation of the Dunblane and Port Arthur shootings likely involved some type of political and media coaching, as their ready-to-go, politically charged responses lacked authenticity, which again is out of character for an American teenager. In 2012, in an article written by Joyce Lee Malcolm published with the Wall Street Journal entitled, “Joyce Lee Malcolm: Two Cautionary Tales of Gun Control,” where she outlined a series of surprising statistics concerning the gun restrictions put in place in Great Britain and Australia following the school shootings of Dunblane and Port Arthur. Despite the preponderance of contrary evidence to the Parkland student’s political script, the US media would not entertain any contrarian views which might challenge what appeared to many as overly simplistic interpretation of historical events by hand-picked student media spokespersons. In 1994, the Violent Crime Control and Law Enforcement Act, which included the federal ‘Assault Weapons Ban’ (AWB) was passed by Congress and signed into law by then President Bill Clinton. Following the implementation of the AWB, specific semi-automatic weapons were prohibited but the ban focused on mounts, stocks, grips and auto-pistols, along with 19 models specified by name. However, nothing in the ‘sunset provision’ appeared to be concerned with actual crime prevention – only a commercial ban on certain weapons. Furthermore, the AWB, failed to decrease murder rates at a state level nationwide. Many critics will claim the 1994 AWB was nothing more than political and media theater – a political stunt by the Clinton campaign in order to create a ‘wedge’ political issue that would help to polarize the political debate and mobilize voters for the mid-term elections – which appears to be exactly what is unfolding in the wake of Parkland shooting in 2018 as evidenced in a number of TV segments where the Democratic Party were happy to let the children of Stoneman Douglas openly say and do anything which quite frankly the ‘adults’ could not get away with. The students then lead calls for voter registration at the March for Our Lives event in Washington DC: “Let’s take this to our local legislators and let’s take this to midterm elections,” said David Hogg. In order to register voters at the event, March for Our Lives partnered with HeadCount, which claims to be a ‘nonpartisan’ organization but in reality is a progressive NGO staffed almost exclusively with progressive activists (more than likely staffed exclusively with Democratic Party membership). In short, the Democratic Party machine and its NGO network has been in a death spiral since the implosion of the Hillary Clinton presidential run in 2016, which has been compounded by the slow motion collapse of the Russiagate conspiracy. Since the 2016 election the Democratic Party’s only agenda has been the following double entendre; to oppose Donald Trump in any way possible and to stoke fears of all things Russian – and nothing else. With Parkland and guns, the national Progressive Alliance finally found an issue and a group of spokesmodels with legs heading into the 2018 mid-term elections. With no discernible party leadership on the Democrat side – only unkempt dinosaurs like Nancy Pelosi, a compromised Bernie Sanders (who caved-in, allowing Hillary Clinton’s manipulation of the DNC), the Democratic Party establishment and their media partners have been quite happy to push this group of under-aged high school students to the frontline of their political war. In short, the children became the political equivalent of human shields for the Democratic Party machine and the progressive alliance. Note at the 3:00 minute mark, Hogg stated, “We never had an active shooter drill at my school, and although we did talk about what to do in this type of situation, nothing could have prepared us for this.” This conflicted with media reports earlier in this article stating that Stoneman Douglas did indeed hold active shooter training on their campus. Even though Hogg’s image appeared to be publicly tarnished following his contrived interview with The Outline, it seemed his newfound media fame was scheduled to continue at least through the upcoming 2018 Congressional mid-term elections. Hogg even used his media propelled personality to call for a boycott of those financially invested in firearms manufacturing. Following the advertiser boycott of Laura Ingraham’s FOX News show, the young gun control activist Hogg, still riding a smart mob induced wave from social media, took on two trillion-dollar investment firms that are heavily invested in gun manufacturing. The Vanguard Group Inc., one of the largest traders in mutual funds, alongside the world’s largest asset manager, BlackRock. Similarly, BlackRock, was “increasingly battling for cash from the same clients,” such as Blackstone, which has undoubtedly made other market rivals of the former division of Blackstone uneasy to say the least. As other Wall Street heavy weights have been critical of the economic growth of Vanguard and BlackRock, you have to wonder if Hogg’s boycott, was really a smoke screen for competitors on the New York Stock Exchange. Another politically motivated student who emerged after the Florida school shooting was Emma Gonzales, a senior at Marjory Stoneman Douglas High School, whose dramatic calls for gun control were given top billing by media, instantly catapulting her into the national spotlight following the recent mass shooting tragedy. Alongside Gonzales and Hogg, within three days of the Parkland mass shooting, media reports stated that the other hand-picked media faces of Parkland, Cameron Kasky, Alex Wind and Jaclyn Corin, somehow managed to independently (at least on the surface, in reality there was a giant Democratic Party affiliated political apparatus working behind the scenes) craft and a gather multi-million dollar celebrity-funded war chest for the ‘March For Our Lives‘ – which the media marketed as a nationwide “student organized campaign” which has called for various restrictive gun laws. As media attention swelled, the anti-gun activist collective known as ‘Never Again MSD ‘ began a coordinated attack against the National Rifle Association (NRA) lobbying organization. Again, students, the Democratic Party machine and the mainstream media – continued to gloss over the obvious failures by law enforcement that predated the attack. Understandably, skeptics were quick challenge the authenticity of the mega student-led protest, when it was revealed that Deena Katz, a co-executive director of the ‘Women’s March’ Los Angeles Foundation and a co-executive producer of Dancing With the Stars, had been enlisted to co-organize the apparent Parkland survivor organized protest rally in Washington, DC coming on March 24. Almost overnight, other “sister marches” popped up throughout the country for a campaign that awarded an instant prime social media presence and merchandising through the website’s very own online store. QUESTION: Was the March For Our Lives protest movement – masquerading as a philanthropic advocacy group – a trigger used to construct a political lobbying umbrella in Washington to take on the NRA? Another aspect to the financial push for gun control directly linked to the financial support of March for Our Lives, is former New York Mayor Michael Bloomberg’s 501(c)(3) organization, Everytown for Gun Safety Support Fund, which is listed as the location for tax-deductible contributions for the advocacy protest group. The insertion of billionaire Bloomberg, and his NGO Everytown, raises questions about the grassroots legitimacy of March for Our Lives. This arrives, as Everytown recently came under fire for publishing false gun data regarding school shootings in America. Rather intriguingly, other questions have emerged suggesting that the permit application for the March For Our Lives rally preceded the Parkland shooting, which some researchers claim was made several months prior to the incident on February 14th. While this researcher does make a compelling argument, it is difficult to corroborate this independent analysis without access to the District of Columbia civic licensing records. As of late February, mainstream media outlets claimed March For Our Lives had filed a permit for the Washington DC rally with the National Park Service. Additional evidence of a political push operating behind the scenes of this case have also been revealed recently. Even former Georgia Congressman Jack Kingston noted the significance of certain groups working to ‘hijack’ this particular mass shooting less than a week after the apparent tragic attack. Although this disturbing trend of mass media management and manipulation of high-profile tragedies has been present in several American mass shootings over the years, nothing has seemingly exploited the apparent ‘survivors’ of the mass casualty event like the Marjory Stoneman Douglas High School shooting. One might argue that the media coverage surrounding the Columbine and Sandy Hook shootings were also all-encompassing, but they pale in comparison to the media and political circus which has been erected around the Parkland tragedy. There’s a deeper systemic problem with media coverage, including the all too familiar reportage of inconsistencies and mainstream censorship taking place after a crisis. With each new troubling event, policy standards for You Tube and Google have resorted to draconian measures to shunt any views, opinions or theories online which dissent from the mainstream consensus reality narrative. As 21WIRE has pointed out with previous high-profile media-driven mass shooting events, the primary focus for the media has always been to craft a divisive narrative between those ‘for or against’ the issue of gun control. This is normally drawn along pre-existing political lines of Liberal vs Conservative, or Democrat vs Republican. With Parkland, a “mental illness background check” has been added to the gun control reform agenda. Once again, the Progressive establishment has used teenage students to nail this new plank to their legislative platform. This has raised objections from those concerned over ‘mental illness’ background checks, along with those who constitutionally oppose such restrictive legislation. In an already over-medicated society where doctors are inventing new psychological diagnoses every day, and where healthcare and police and government are moving towards consolidating all of our data in the cloud, the potential for bureaucratic abuse, stigmatization and marginalization of anyone deemed to have ‘mental issues’ should be a cause for concern. Will there be different ‘rules of engagement’ by police for someone presumed to have a history of ‘mental issues’? The answer most certainly will be yes. These, along with other issues concerning the rights of individuals, are hardly spoken of or addressed in the current discourse. According to FBI gun crime statistics from 1980-2008, there was a sharp decline overall in gun related deaths involving teens and young adults. The FBI’s data confirmed a peak in those statistics in 1993, which dramatically decreased by 2008. Depending on the mass casualty exercise, ‘role players’ can be actual first responders or actors – blurring the line between a drill and real incident. Moreover, the use of mass casualty exercises and other emergency readiness drills have seen a sharp uptick under the federally-funded umbrella of active shooter training scenarios taking place across America. “After a spate of horrific shootings at schools and businesses across the country, employers started conducting unannounced “active shooter” drills to train employees how to react if a murderous gunman shows up at their workplace. Unsurprisingly, some of these unannounced drills have gone awry. Pine Eagle’s disastrous training was then followed by a civilian shooting death during a police drill in Punta Gorda, Florida where blank ammunition was supposed to have been used. 21WIRE covered the shockingly under-reported ‘active shooter’ role play production gone awry in August of 2016. The following graph from the National Center for Education Statistics published in a report by VOX depicting the increase in active shooter drills. As mentioned earlier, despite the billions being spent on militarizing civilian spaces in America, no studies have done to evaluate the psychological impact of subjecting children to repeated hyper-real simulations of violence. Besides this, it’s difficult to know how effective these exercises are in ‘saving lives’, but they do illustrate a growing ‘threat industry’ that has seen some schools running regular active shooter drills – with some later confronting the very crimes they’ve been preparing for. Understandably, some skeptic will then ask: what are the odds of that? Interestingly, even though there has been a heavy emphasis on stopping active shooter crimes, according to the National Crime Victims’ Rights Week (NCVRW) from 2000-2015, the active shooter trend has seen a dramatic increase despite changes to gun legislation and supposedly preventive training exercises sweeping across the country. Since ALERRT’s inception in 2002, they have received “more than $50 Million in state and federal grant funding,” on their way to becoming the standard for active shooter training in America along with ALICE (Alert, Lockdown, Inform, Counter, Evacuate) and Shots Fired on Campus – yet they’ve done relatively little to prevent these unexplained attacks from happening according to the data collated above. QUESTION: How is it possible that soft targets in America are less prepared now, after nearly two decades of threat assessments and ‘active shooter’ training? In addition to the active shooter paradox, there is also the allocation of funding in the wake of controversial attacks such as the Parkland tragedy. Similarly, the state’s financial response to the Parkland event is unprecedented: “Florida Gov. Rick Scott unveiled a $500 million “action plan” to prevent gun violence,“ a week after the forensically unclear shooting at Stoneman Douglas. This is a half billion dollars in funding – which will end up in the hands of any number of government contractor awardees or emergency services departments and quangos. Who will be the recipients, and what other interests do these parties have in areas like politics and media? Still, with all the money allocated and new regulations passed, we still return back to the original question. While US Congressional leaders have approved a bill centered on new gun control protocols as well as new identification safety measures, it fails to address the warning signs supposedly missed by the FBI and local police at the Broward County Sheriff’s Office – something that should have been rudimentary for America’s apparently premier law enforcement agency. As the political stakes have increased with each new bizarre large-scale mass shooting, some in independent media have been unfairly maligned for attempting to questions or look for answers in these complex crime scenes. Because of the increasing media and political dimensions of these events, the analysis invariably goes beyond the forensic analysis of these cases, into both political and financial components. All of these are worth examining in addition to the threat assessment field’s active shooter events. In the midst of YouTube’s enhanced censorship crackdown in recent months, while the country was still reeling from the Parkland event, the video-sharing company’s headquarters was allegedly targeted by the disgruntled social media persona Nasim Aghdam, who had supposedly been ‘upset’ about the website’s policies concerning censorship. However, it quickly emerged that the avatar-like YouTube shooter, had been reported missing – and was found by police just hours before the attack. The bizarre incident seemed to fit a ready-made political narrative – one that simultaneously supercharged calls for gun control just like the Parkland event and in the process, it demonized those legitimately challenging repressive internet censorship policies. While calls for new gun legislation in America have grown after Parkland and other mass shootings, it’s important to remember that not to long ago, the Obama Administration was embroiled in a massive gun-running scandal – where AG Eric Holder stood accused of playing a large role in the covert ‘gun-walking’ program that intentionally sent thousands of illegal firearms into Arizona and Mexico under the moniker Operation Fast & Furious. The reckless government program resulted in a number of violent deaths. It’s worth noting again, that specific Justice Department documents related to the program were withheld from a Congressional inquiry and Holder became the first sitting member of the Cabinet of the United States to be held in contempt of Congress on June 28, 2012. Holder was protected by executive privilege in a bold and controversial move by the White House just minutes before the attorney general was held in contempt. Incidentally, 64,280 redacted pages of Operation Fast & Furious were released in 2014 – with many documents still pending. In 2018, the Sessions-led Department of Justice announced plans to release all internal documents pertaining to the gun-walking program known as Fast & Furious. The real irony here is that you had a previous Democratic administration attempting to implement restrictive gun reform and threatening the use of executive order to do so following certain mass shooting events – while simultaneously operating a controversial gun-running program under the guise of the Department of Justice. In reality, the United States government, and especially under Barack Obama, has been one of the world’s biggest trafficker of illegal weapons, and mostly into the hands of terrorists in war zones like Syria – resulting in untold violence and deaths of innocent civilians. Once again, from a comparative perspective, the timing of the Florida school shooting attack should not be discounted either, as it fell in the middle of a collapse of the nearly two-year investigation into alleged “Russian influence” in America’s 2016 presidential election – providing a much needed media distraction, as well as a reversal of fortunes for a Democratic Party and its media establishment which were flagging after having to explain to the American public why the Russiagate “witch hunt” had stalled and why so much public money and resources were wasted in the process. In the end, like other anomaly-ridden mass shootings, the Parkland event was quickly spun into a mass media extravaganza – with a perfect cast of victims and villains, and with a slick Hollywood-backed protest movement complete with merchandising and a cadre of political activists and social media teen pin-ups. This could be the new model for future active shooter ‘first responder’ mass casualty events, where a media-led, guilt-based groupthink model of political grandstanding, child exploitation, is then followed by relentless shaming and brow-beating of anyone who dares challenge the politically correct narrative. This could be the new raison d’etre of the daily shooter. Perhaps the biggest tragedy of all is that for the body politic, this Parkland tragedy has been superseded by partisan demagoguery at the highest levels.